2016 Volvo V40 facelift - pictures and details revealed | What Car? Volvo has refreshed the V40 for 2016, with styling brought into line with the S90, V90 and XC90, improved emissions and updates to the car's interior. The V40 is Volvo's medium hatchback, which competes with upmarket hatches like the BMW 1 Series, Audi A3 and Mercedes-Benz A-Class, as well as market favourites such as the Ford Focus and Volkswagen Golf. Volvo has refreshed the V40, giving it the new Volvo family face and t-shaped LED daytime running lights. New colours are also being offered on the refreshed model. As it's a facelift rather than an all-new model, the engine range of the V40 remains the same, although emissions of the D2 engine with manual transmission are reduced to 89g/km. Petrol engines are a trio of 1.6-litre units, badged T2, T3 or T4, and a range-topping 2.5-litre T5. The most frugal of these is the T2, which achieves a claimed 53.3mpg and emissions of 124g/km. The 241bhp T5, with claimed emissions of 189g/km and 34.9mpg fuel economy, is likely to be a rare sight on UK roads because it has comparatively high running costs. Diesel engines are 1.6-litre D2 units, or 2.0-litre D3 or D4 engines, which manage respective claimed fuel economies of 83.1, 65.7 and 74.3mpg, and emissions of 88, 114 and 99g/km respectively. There's new interior trim available on the new V40, including three aluminium variations and contrasting stitching on interior door trim panels, as well as a new 'City Weave' upholstery option. A black headlining will also be available on the facelifted model. Volvo's On Call app, which allows drivers to access certain car functions through their smartphone, has also been updated, including the addition of calendar syncing to the app, which then adds diary entries to the sat-nav, and Windows 10 connectivity. Instrument panel air vents also now have Volvo's CleanZone filters included, which Volvo claims improves interior air quality by removing pollutants from air entering the car. 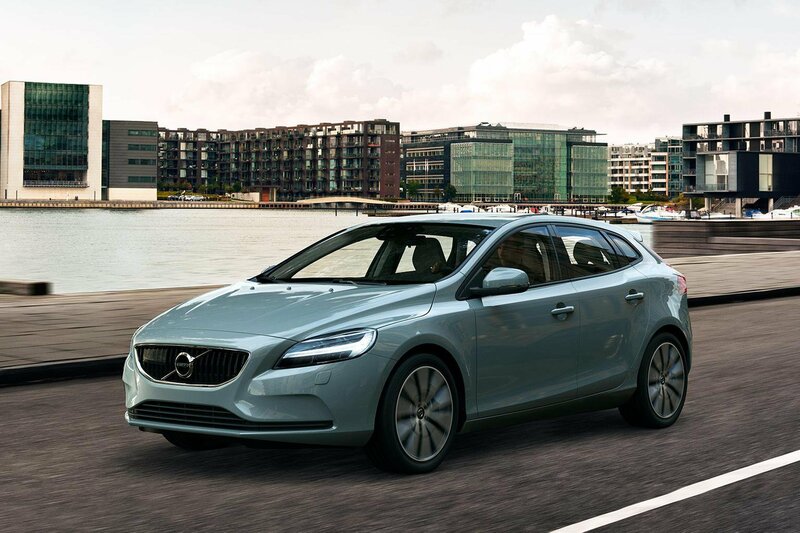 The current V40 comes with climate control, Bluetooth, DAB radio and alloy wheels from base-spec ES cars upwards, while SE brings cruise control, automatic wipers, and upgraded trum outside and inside. The SE Lux spec adds leather upholstery and xenon headlights, and the range is topped by sporty R-Design and R-Design Lux specs. Pricing hasn't yet been released for the facelifted V40, although it shouldn't stray far from the curren't V40's £19,195 starting price. Orders will be taken from May onwards, with first deliveries expected in June. In addition to the styling changes, eight new wheel designs have been added across the V40 range. More details on the V40 facelift will be revealed at its official debut.